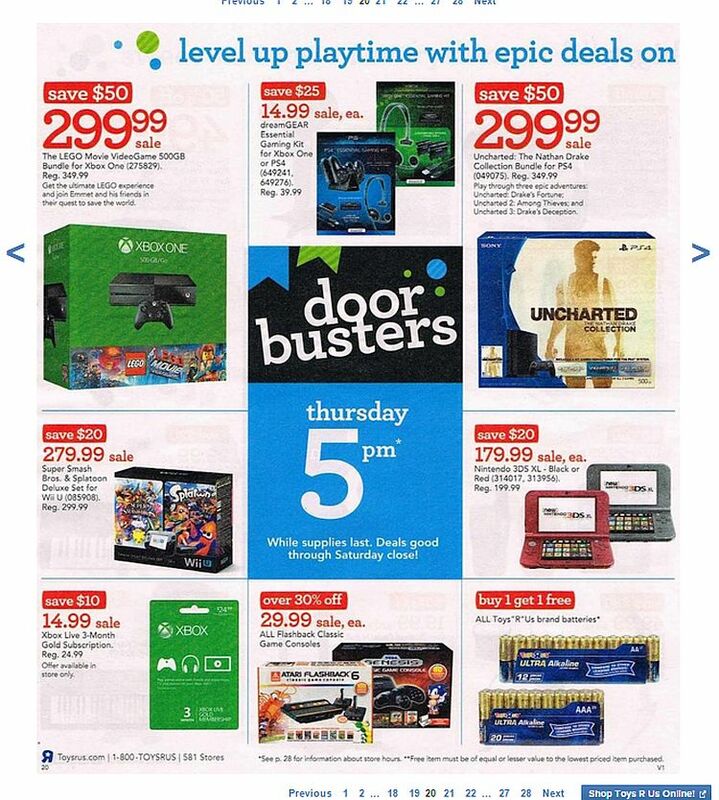 The Toys ‘R Us Black Friday ad has leaked, and there’s nothing truly mind-blowing on the Xbox One and PS4 bundle front. 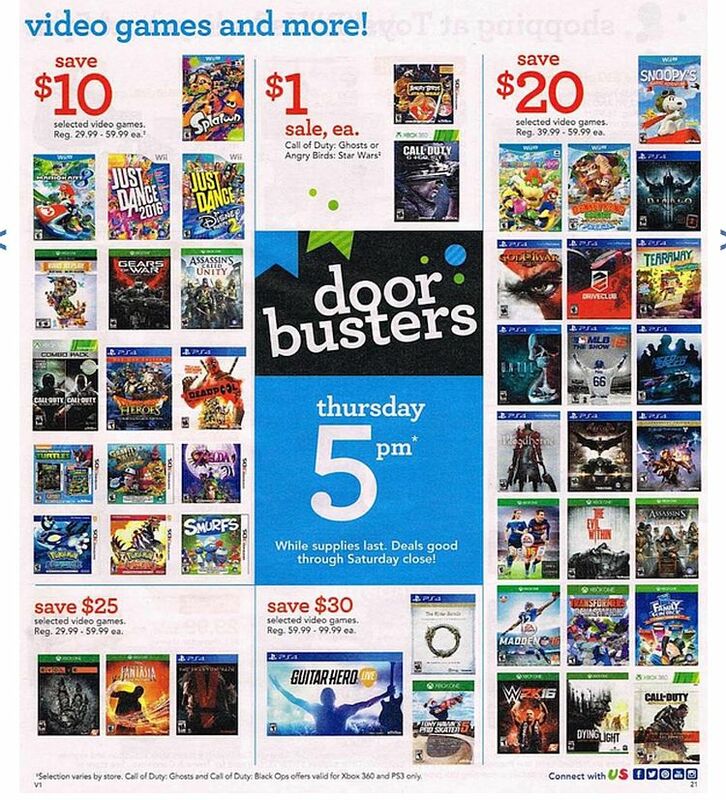 If you are looking for Skylanders SuperCharger figurines though, you can pick them up buy 1 get 1 for 80% off as a door buster deal starting at 5pm on Black Friday local time. The Nathan Drake Collection PS4 bundle is available for $299 like everywhere else, and the store has the same $299 Xbox One LEGO Movie: The Video Game bundle as Kohl’s. Standard Nintendo 3DS XL handheld are on sale for $179, and the Deluxe Wii U Super Smash Bros. and Splatoon bundle will run you $279.99 – but Walmart is cheaper at $249. All Flash Back game consoles such as SEGA Genesis and Atari are on sale for $29.99 each, and various new and last year’s releases which normally run anywhere from $29.99 to $59.99 are $10-$25 off – some even $30 off like the Guitar Hero Live Pack. Halo and Call of Duty Mega Block sets are on sale for $14.99 each, so those could be something fun for you or your little one. You can look over the entire circular through Best Black Friday. There is nothing truly spectacular in there as far as gaming or console deals you can’t find elsewhere, but if you’re there to grab some toys, you can save yourself some gas money. And from getting shot over a parking space. Be sure to check out the best deals on PlayStation 4 through our Black Friday hub. Xbox One users also have a separate Black Friday hub. We comb through the ads so you don’t have to.